Whole Foods Market continues to lower prices for customers, which will not happen at the expense of the quality that customers know and expect from us, CEO and co-founder, John Mackey, has shared. Value is about more than dollars and cents; it’s about “quality first.” Behind the price tag of almost every product is a story about quality and the requirements that lead the industry and make many of our products different than other grocers. For nearly 40 years, Whole Foods Market’s purpose has been to nourish people and the planet, and that remains true today. We believe that customers should know where their food comes from, how it is grown, and what ingredients are used. We want customers to feel good about what they’re putting in their baskets, and in many cases, customers choose to shop with us because of what they know they won’t find in the products we sell, such as high-fructose corn syrup and artificial sweeteners. Have you ever wondered what’s different about what we sell or why certain items seem to cost a bit more? Our standards for all food sold prohibit more than 100 preservatives, flavors, colors, and other ingredients commonly found in food, including high-fructose corn syrup and artificial sweeteners. As a company, we hold ourselves accountable – relying on internal and third party audits to ensure that standards are met. It helps to compare apples to apples; the products we offer are usually different in ways that can’t always be seen at a glance. 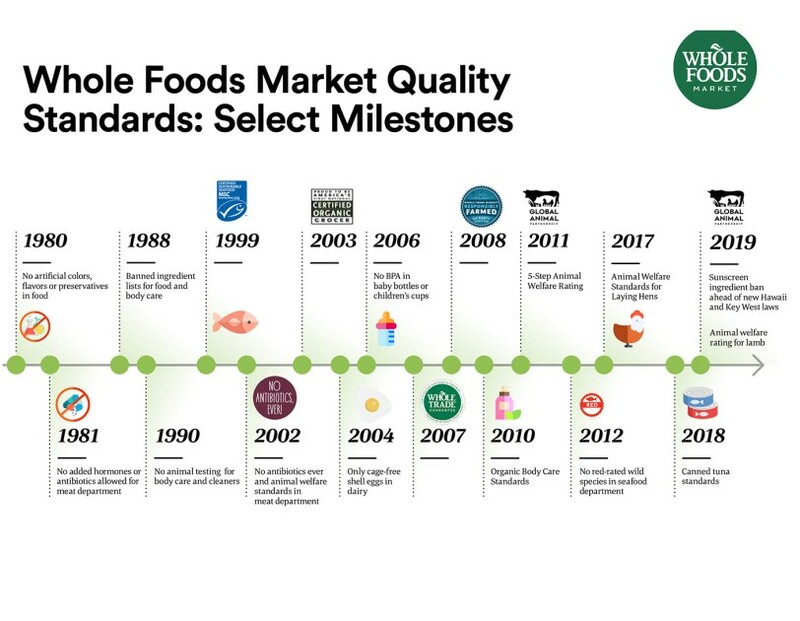 Whole Foods Market is the first and only “Certified Organic” national grocer in the U.S. – a designation held since 2003. This means each store is third party audited annually to ensure we’re going the extra mile to maintain the organic integrity of a product until the moment you choose it from a display. Almost every single week, company experts are in the field checking on the farms where fruits and vegetables are grown and sourced. This team of field inspectors has more than 158 years of experience, combined. We have long worked with scientists, non-government organizations, industry experts, and farmer, rancher, and supplier partners to develop innovative practices for the quality of the meat we offer. We have animal welfare standard requirements across the meat department, including more than 100 animal welfare standards for beef, pork, chicken, turkey, and lamb. Antibiotics are prohibited in raising animals for all products in our meat department. The animals may take longer to raise, which requires more resources and time compared to how most animals are raised for meat. We only sell sustainable wild-caught and Responsibly Farmed seafood, addressing both environmental concerns and the things seafood lovers care most about: water quality, antibiotics, and supply for future generations. Stores don’t sell “red-rated” seafood, which indicates a species that may be overfished, poorly managed or caught in ways that cause harm to habitats or other wildlife. We also do not use the types of preservatives often used on seafood at other grocery stores. In 2005, long before other retailers and restaurants, we required eggs sold in the dairy case and used in our own kitchens to be cage-free. Now we are going beyond cage-free by implementing animal welfare standards for laying hens. In addition, all 365 Everyday Value brand dairy products – such as milk, cheese, butter, and yogurt – are made with milk from animals not given synthetic growth hormones. Learn more about what differentiates our quality and standards.